I did spend a great deal of time planning these menus, with a pile of cookbooks and magazines at hand, as as my pinterest as inspiration. Some weeks, things come to me easier than others. One of the things that most overwhelms me is trying to be sure I have ALL the ingredients planned out for all my dinners, and then plenty of options for my other meals I eat throughout the day. I'm still doing about 6 small meals a day - I've train my body to expect something nourishing and healthy on these regular 2 1/2-3 hour intervals, and it seems to work best for me. note: each day is annotated with the main meal for the day and any noteworthy combinations of things throughout the day. 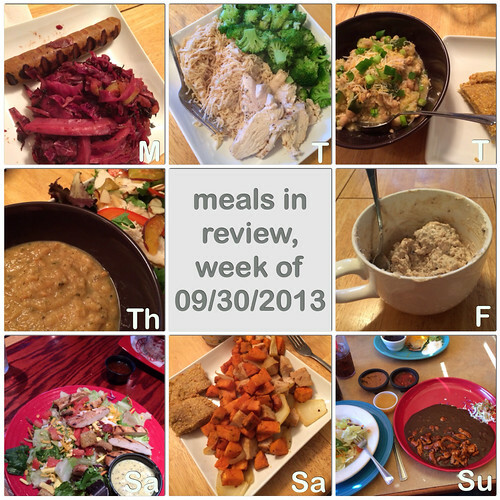 note: this does not always consistitute the entire days meals, you can look at my MyFitnessPal if you want more details! 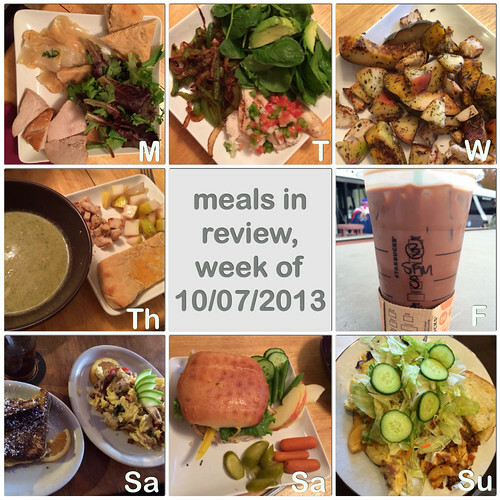 What did YOU eat that you really loved last week? Monday, 9/30: Braised red cabbage and tofurkey sausage. This was a repeat idea after my first try inspired by our German food on our anniversary trip. After a busy weekend, I swapped days of my meal plan around because this was less labor intensive than the original Monday plan! protein shake: pumpkin/banana. breakfast: eggs, sausage, peppers, and zucchini. Tuesday, 10/1: White turkey chile chili with healthy cornbread. Inspired by the Eating Well magazine (recipe was in the Sept/Oct 2013 issue), this was a white chili (on instagram) featuring ground turkey, zucchini, green chiles, and I subbed in quinoa instead of bulger. I didn't ever like beans growing up, but this wasn't bad. I made two chilis (on instagram), so Eric had one with TVP and tomato sauce. For the cornbread, I used the recipe also in that issue, but subbed olive oil, soy milk, and used less honey than called for - which made them more like a thick cracker consistency! protein shake: green smoothie with plums. breakfast: egg sandwich with Dave's killer bread and leftover blueberry jam. lunch: shiritaki noodles with ginger, garlic, broccoli, and chicken. Wednesday, 10/2: early dinner - cole slaw with chicken and apples. protein shake: green smoothie with blueberries. treat: coffee with cinnamon fiasco (on instagram, Facebook, with helpful discussion). lunch: leftover chile chili. treat: Leslie's chocolate zucchini cake. Thursday, 10/3: Parsnip soup and salad with chicken. I am in love with this soup - roasted parsnips and garlic puréed with broth and a little cheese (needs to be written up for theredkitchen still!) protein shake: green smoothie with peaches. breakfast: eggs, peppers, zucchini, and sausages. lunch: roasted cauliflower, corn, and meatless meatballs (on instagram). Friday, 10/4: acorn squash with chicken and a salad. first Friday means a knitting teaching morning (on instagram)! breakfast I: eggs and veggies. breakfast II: overnight oats with raisins (on instagram). lunch: leftover chile chili. Saturday, 10/5: lunch OUT - Red Robin's simply grilled chicken salad. dinner IN - roasted yams with onions, turkey, and cornbread (on instagram). protein shake: green smoothie with blueberries. Sunday, 10/6: lunch OUT - Mexican chicken mole with salad. dinner IN - chicken pattie with broccoli and salad. breakfast: applesauce, yogurt, homemade granola. Monday, 10/7: pumpkin ravioli with turkey and breadsticks. The raviolis were made in wonton wrappers from pumpkin and ricotta and egg and seasonings, and then boiled gently and served with a sage butter. protein shake: green smoothie with blueberries. breakfast: eggs, sausages, veggies. Tuesday, 10/8: chicken with pico de gallo, salad with avocado, and fajita grilled veggies. I enjoy pico de gallo (for me, it's tomato, jalapeño, red onion, and a squeeze of lime juice), and so I had the idea of grilling some chicken and serving it with the salsa on top. It was nice! I made E an Enchilada casserole. protein shake: banana, coffee, pumpkin. breakfast: pumpkin pancakes, frozen homemade turkey sausage, and zucchini with mozzarella (on instagram). lunch: roasted cauliflower, corn, and meatless meatballs. treat: brownie smoothie with coffee, peanut butter, and raisins; made pickles (on instagram). activity: rode exercise bike. Wednesday, 10/9: early dinner - roasted yam, onions, and turkey. protein shake: green smoothie with pumpkin and peaches. lunch: chicken with pears and acorn squash. snack: toast with peanut butter. treat: made Apricot Cardamom cookies and gluten free Almond Honey Flax cookies for my knitting friends and for a treat for the inlaws for the weekend (on instagram). Thursday, 10/10: broccoli cheese with turkey soup; leftover breadsticks, pears on the side. Soup recipe was modified from the Fresh 20 cookbook (on amazon) to use roasted broccoli, which was slightly overdone and "smoked" tasting. The remainder of the fancy souvineer cheese (Vlaskaas) was great in here too. I drizzled the pears with cherry almond balsamic vinegar. protein shake: green smoothie with blueberries. breakfast: eggs, sausages, veggies, and leftover pico de gallo. lunch: edamame. Friday, 10/11: dinner OUT (not pictured) at Tasting East with the inlaws. I insisted on the salt and pepper tofu again, as I loved that a lot. I got a basil stir fry with chicken, and tasted a little of several other tofu and veggie dishes the family got. protein shake: green smoothie with banana and cocoa. breakfast: overnight oats with pumpkin and almond butter. lunch: roasted yams, onions, and turkey. treat: Starbucks weak americano with soy and sugar free chocolate syrup (on instagram). Saturday, 10/12: breakfast OUT at Tin Shed with the inlaws - Sweet Chix scramble (eggs, onion, pepper, Brie, basil, and green apple) with a slice of Sin (sweet potato French toast! ), and a taste of a biscuit with their incredible raspberry jam. dinner IN - sandwich with veggies, apples, and homemade pickles. My sandwich had herb turkey and cheese, with onions and yellow peppers. The ciabatta rolls from Costco were quite the treat, and were almost a barrier for me because I hadn't let myself enjoy one since I lost the weight. I did have an internal dialog with myself wondering if I should eat one or not, but in the end, I did, and just allotted calories to balance it out: I'm definitely still a work in process with my eating behaviors and self-talk, and documenting these things may help me act less like a crazy person in the future. last meal: yogurt with pumpkin and granola. Sunday, 10/13: late lunch OUT with my family - Macaroni and Cheese bar including 3 varieties plus goulash, garlic bread, salad, and apple cake. I choose to eat extra veggies before arriving and then ate in moderation with the mass of my plate covered with salad and a small tastes of each other thing (on instagram). protein shake: banana, peanut butter, and raisin. lunch: snow peas and baby carrots. dinner: leftover yams with peppers and turkey. 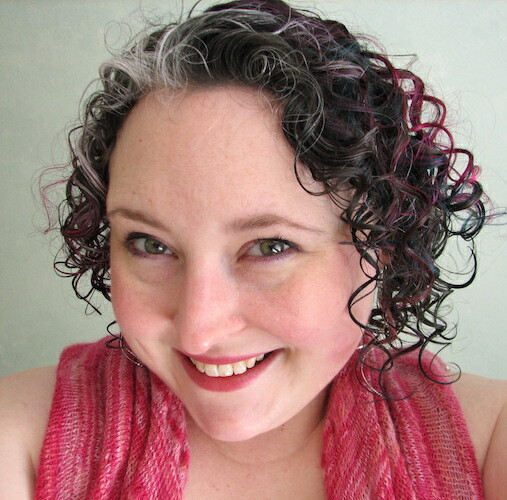 This page contains a single entry by kristine published on October 15, 2013 12:22 PM. back to basics: GHG, exercise, and goal recap. was the previous entry in this blog. fit kristine: 4 thoughts and a link is the next entry in this blog.